Did you know that 96 percent of individuals who visit your website are not ready to buy anything (but likely will in the future)? Many consumers and business product buyers are doing the online equivalent of window shopping when they find their way to your products and services. According to a 2015 Google Survey, 89 percent of B2B researchers used the internet during their product research process. So, how do you keep them engaged until they are ready for a B2B sale? Savvy marketers know that marketing sales funnels are a must. According to data gathered by PropellerCRM, nurtured leads typically result in 20 percent more sales opportunities than non-nurtured leads, and sales funnels are vital in making this happen. However, content marketing plays a huge part in this process. The Aberdeen Group found that conversion rates were 6 times higher for companies who utilized content marketing. So, the best way to secure B2B sales leads is to blend the effectiveness of both sales funnels and content marketing. 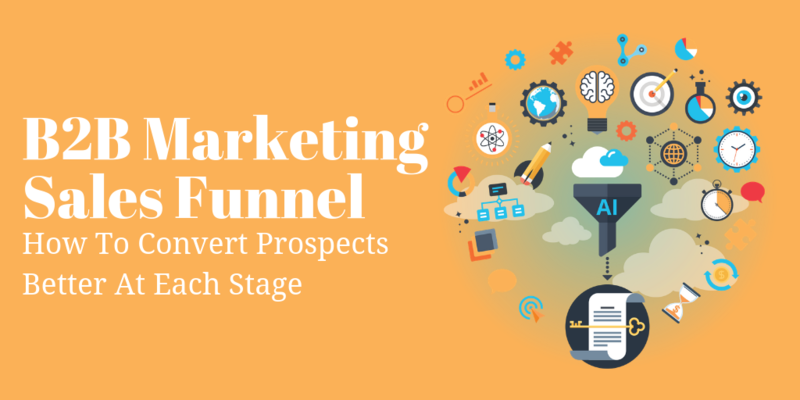 Each stage of the marketing sales funnel process can benefit from content marketing that guides potential B2B clients to the next phase. That being said, which types of content correspond best to the different steps in the B2B marketing sales funnel? This stage is where buyers are identifying the problem or challenge their company is facing, and how they will begin to educate themselves in solving it. At this point, they are beginning their research and trying to find as much information as they can. They are not ready to buy and are only in the data-gathering part of their buyer journey. For example, a corporate social media marketer may realize their current social listening and monitoring tool is not capturing all the insights their company needs. It could be that their customer support representatives are missing critical social media mentions, and an ad-hoc report has revealed this to them. The B2B buyer is now aware of the problem and is ready to search for another company to solve this issue. They might then come across your website, and your goal is to convert them from a visitor to a subscriber. This will allow them to easily continue on their buyer journey with you when they are ready to purchase. Don’t take for granted that everyone knows what your company does. Dedicate at least one blog post out of the month to describe another aspect of your product or another perspective on what your company offers. Be sure to categorize your blog posts so B2B buyers can easily find out about what you do. Include an embedded email sign-up form as well as a pop-up. Use both mediums to briefly describe what your newsletter will be about, and why they should subscribe. Be sure to explain further if it will be sent weekly or bi-weekly. Not only can you expose them to more content, but you now have contact information you can begin to track on a CRM system. Another great way to introduce B2B buyers to what you do, and prepare them to convert is by offering a helpful freebie. This resource could be an ebook, webinar, or infographic that describes how you solve problems in your industry. You can use then this as an email sign-up incentive. This is the time where B2B buyers now know exactly what their problem is and are searching your site to see what solutions you have to offer. You have given them the introductory information they need, and they are now combing through it to see how you can help them. As an example, we will keep on with our social media marketer scenario; a B2B social media marketing company would advertise an ebook with tips on how to use their product to improve the social listening process. In turn, the B2B buyer might subscribe to the newsletter to receive this offering, and through this make the decision to schedule a demo with the social media marketing company’s sales team. The ebook gave the buyer solutions on how to solve the problem and general education on the issue. The ultimate goal of this stage is to help the buyer transition from a subscriber to a user. At this point, the B2B buyer is familiar with you, now they want to know more about you and the results you can bring to their company. This is an excellent time to expose them to testimonials and reviews about your work. You can include this on your website and provide links on email newsletters. These reviews should specifically touch on the results your company produced, and provide details on the customer experience. Case studies are another great way to give information about what your company has done for other B2B buyers. These are a lot more in-depth and detailed when compared to a one to two-sentence customer review. Case studies outline the process of the customer experience from beginning to end. It also likely includes diagrams and numerical data to drive home your company’s impact. While text is excellent, do not forget about the power of video. Webinars can help you set yourself apart from the competition by visually showing how your company works with clients and gets things done. You can use webinars to provide insight into a pertinent industry issue or share the results of your work with another company. The whole point is to begin to differentiate your company from competitors and position yourself as the only choice. According to Think With Google, nearly 50 percent of potential B2B buyers watch 30 minutes or more of B2B-related videos. As the last stage in the marketing sales funnel, this is where users transition to becoming long-term customers. The goal is not only to solidify conversion but to keep them coming back for more of your products and services. The trust that you have built through your content is set to pay off here. Again, revisiting our original example, the demo has now led to the B2B buyer deciding to go with the social media marketing firms company. They commit to a one-month plan to try out the product. Now, it is the company’s job to ensure this is not a one-time-buy, but that this user turns into a long-term customer. B2B buyers want to know the company they choose to go with has the resources to ensure they will have an exemplary experience. FAQs are a must for long-term customers. Create an information library where they can quickly find answers to the most basic questions they will have as a customer. Instructional videos are excellent for teaching customers how to use the product in specific ways, and it goes the extra mile to show that your company cares to provide any information they need to be successful with your product or service. They know they can count on your company to walk them through using your product. Be sure to show your appreciation for their patronage by sending a personalized 'thank you' email. Express your thanks for them trusting your brand enough to purchase from you, but also take the time to walk them through the first bells and whistles of your product. Link to instructional videos, FAQs, help desk forums, and blogs that are pertinent to the product they are using. According to CMO Council, only 9 percent of B2B buyers trust information from vendors. Instead, they are more interested in content that highlights the experiences past customers have had with your brand. Utilizing relevant and personalized content during every part of the marketing sales funnel process increases trust between B2B companies and interested buyers. The goal is to provide them with all the information they need during the awareness, consideration, and decision stages to make a well-informed decision about how to move forward to address their problems. Having a marketing sales funnel helps you organize their buyer journey and plan your steps to ensure they become a long-term customer. As the data above reveals, using these tools together will increase success with even your most undecided leads.